Call (888) 751-5125 to speak with a member of our team. 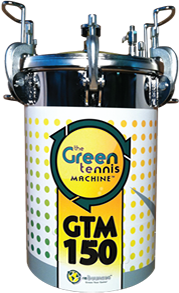 The GTM 150 is currently our smallest Green Tennis Machine and is ideal for high school tennis coaches, small to medium tennis facilities, or active individual pros. The 150 can re-pressurize 150 balls every 72 hours (that’s over 300 balls, or 4 cases per week!). Utilizing our revolutionary reBounces technology, you can now restore dead balls back to their original bounce. The Green Tennis Machine extends the life of your practice balls and reduces waste that goes to landfills. On average our clients save over 50% on their practice ball budgets and are finding that they can cut back on purchasing enough new tennis balls to more than pay for their Green Tennis Machines. And with our various financing options, they are not having to make a capital investment in a tennis ball pressurizer. Let us show you how we can save you money and improve your ball consistency. reBounces smallest tennis ball pressurizer holds 150 balls in each cycle. $69/month SmartBuys make this perfect for any size budget or tennis facility. Our GTM150 works well and allows us to cut down on new ball purchases and be more ‘green”. The machine has been fantastic up to this point. I have had no problems and it has been great! I have cycled the balls through a couple of times now and was happy with the results. Very happy. The Green Tennis Machine has been great. Our ball budget has decreased immensely. We have been able to utilize the Green Tennis Machine very effectively in the teaching program. It doesn’t take very long to basically cook up the balls and get them back in the system within 3 or 4 days. So, it has been a great help and a great benefit for the overall operation — regular regulation yellow official tennis balls as well as regular quick start, red, green and orange balls. The Green Tennis Machine we purchased a year ago has been great!! We use it for both lessons and the ball throwing machine, which previously was a challenge to stock good bouncing balls. Prior to purchasing the Green Machine we had 3 practice ball orders and now we have 1 — we eliminated 2 of the orders. I would highly recommend the Green Tennis Machine. For me it’s been great. I always know that I’m going to have good balls coming through. It’s just been something that’s been really successful for us. We have eliminated approximately 75% of the balls we used to purchase for our camps each year. Using the Green Machine has been a great addition to our club and tennis teams. We are able to keep our tennis balls ‘as good as new’ which allows us to use quality tennis balls for our tennis programming and college practices. It truly has revolutionized tennis balls and has been able to keep our costs down from having to always purchase new balls. Great product!